Normally I would have posted this about over a week ago! But I've been so busy with life that I just didn't end up doing it. Though it's been busy, it's the good type of busy. You know, the one where you're being really productive? That one. 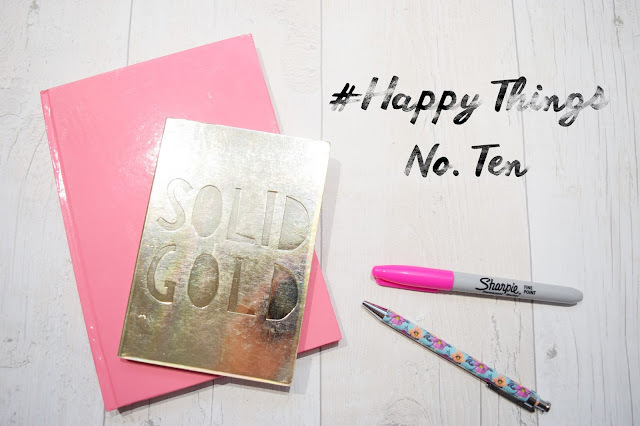 Alas, I'm finally here with my tenth happy things post sharing eight things that have been making me happy with me this past month. Enjoy! Blogger Mail - This month I received a couple of pieces of blogger mail and I can't lie, I absolutely love getting blogger mail. I really appreciate every opportunity I get and I love having something new and cool to write about for you. I'm currently have 3 new posts I should be posting sometime in the next two weeks so keep an eye out for those! Jumpers - It's officially jumper season again and I've loved bringing my jumpers out for the winter again. This is despite the fact that I hate the cold. I can't help but love the layering of jumpers and keeping warm. All the jumpers and sweaters please! Passing my essay - This month I got the results back for my first essay and I'm so pleased to say I passed! I was really happy to see that I'd managed to get past my first essay and it boosted my confidence for the next one! Warm fires - Again, though I hate the cold, I love the things that it brings. We have a wood burning stove in our front room and I love getting the fire wood and making a lovely fire to warm up the house and sit in front of. Breakfast - I've really been enjoying breakfast times this past month. Having a warm bowl of porridge on a cold morning makes me happy and when I fancy something colder or crunchier, I've really been enjoying my favourite cereals. I don't know why but breakfast is my favourite meal of the day - thus being a happy thing for me! Me time - Any me time I've had has been precious. I've had a lot of work to do recently, and I've even lost some precious blogging time to ensure that I have time to myself. To make sure that I am looking after myself and relaxing when I need it. Though I've been guilt ridden that I haven't blogged properly and that I've taken time away from it, it's made me happy that I've had time to myself and made it too. Busted Signed Album - I ordered myself a signed copy of the new Busted album a couple of weeks ago after almost buying it on iTunes. I knew I wanted a physical copy of the album and after seeing that signed copies were available on their website I just had to order it! I'm so excited for it to come when it's finally released on the 11th November! Thomas Sabo Bracelet - It sometimes takes losing something for a few days to realise how important something is to you and my Thomas Sabo bracelet is one of those thing. I absolutely adore the thing and remembered how much when I lost it for a few days a while back. It made me so ridiculously happy when I found it and I can happily say I won't be losing it like that any time soon! What's been making you smile this month? Ahh, yes warm fires. I love how you worded that "I hate the cold, I love the things that it brings." So true! I actually like the cold weather and I'm happy that the hot chocolate and warm fire season has begun.